Brown Brothers is a family-owned wine company founded in 1889 by John Francis Brown and known in Australia and overseas for its wide range of wine varieties. Proud of her family’s heritage, CSU graduate Katherine Brown is also keen to be part of Brown Brothers’ future. The oldest daughter of Ross and Judy Brown, Katherine joined Brown Brothers in time for the 2009 vintage where she gained experience as a cellar hand before travelling to Bordeaux and Champagne later in the same year. She returned to the family business in January 2010 and moved into sales area manager and brand ambassador roles. Along with degrees in entrepreneurship from RMIT and wine business from Adelaide University, Katherine completed her Master of Viticulture and Oenology from CSU in 2013 while working full-time for Brown Brothers. 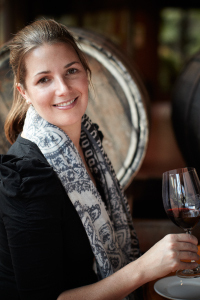 Here Katherine shares her commitment to getting Australian wines on international wine lists. I’m currently…Brand Manager at Brown Brothers Wines. I look after our top selling wines including Moscato. Wine needs to be made with passion, so I must be passionate to excel in this industry. At school I...was a true tom-boy; no Barbie dolls or fairy dresses for me! My childhood was...full of adventure, with afternoons playing in the paddock and days of building cubbies. I was curious about how things worked and I still like to pull things apart to understand them. I chose CSU because …it was flexible with my study and full-time work needs. My best experience at CSU...was residential schools in Wagga Wagga. These week long trips brought together an amazing group of wine enthusiasts who loved to share good bottles with each other. My worst experience at CSU...was trying to find my way around the Wagga Wagga Campus on the first day; I never imagined that a campus could be so big! At university I was inspired… to understand all areas of the wine industry, from winemaking, the needs of the vines and the excitement of marketing. Today I’m motivated… to drive the Australian wine industry to export success over the next decade. In my profession it is important to… keep looking ‘outside the box’ and work with the theme of innovation in mind. The biggest influence in my life... my father and uncles, they have built an amazing wine business from a family farm in the past 50 years. I’m most proud of… my grandmother, Patricia Brown, she was an amazing female leader of her time. My greatest achievement is... graduating my Masters at CSU. In the future I’d like to… make great wine to enjoy and talk about with my friends. The best piece of advice I ever received... was from my mother; too many to quote as she has so many gems of wisdom. The single-most important issue in the world is… lack of Australian wines on international wine lists. The thing I wish I had done but never got around to...is a trip to South America; it is on my to-do list so I am sure it will happen one day.